When it comes to interior design, there’s good, there’s better and there’s best. And the best is what this photo-packed, design-inspired feature story is all about. When it comes to interior design, there’s good, there’s better and there’s best. And the best is what this photo-packed, design-inspired feature story is all about. 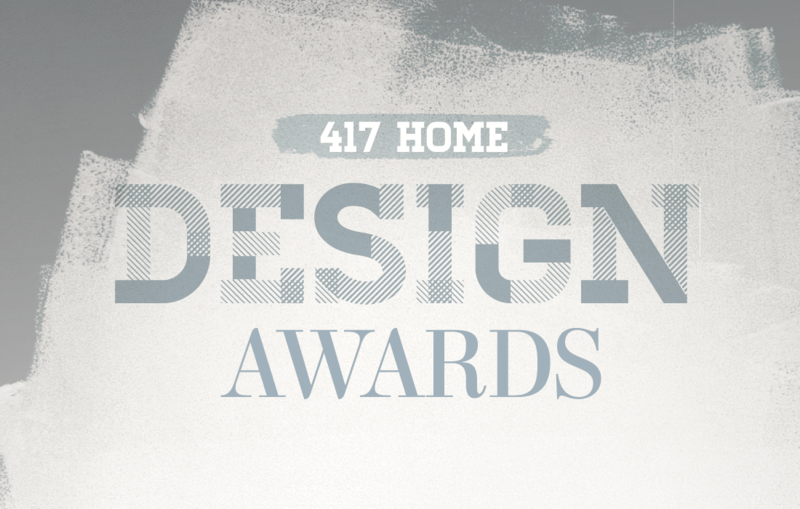 It all started last winter, when we asked all of 417-land’s interior designers to show us all their latest home design projects for our annual 417 Home Design Awards contest. 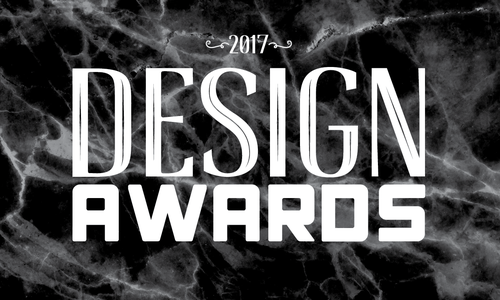 We collected a record-breaking 75 entries this year, with each and every one offering gorgeous, creative and innovative designs worthy of a feature on their own. After sorting the projects, we sent them to the American Society of Interior Designers Missouri-East Chapter in St. Louis, where a team of professional interior designers judged each project based on aesthetics, design and a narrative explanation. They passed along a list containing the highest scoring projects in each category, then our 417 Home editor toured each contender in person to take in the first-class work and confirm the winners. 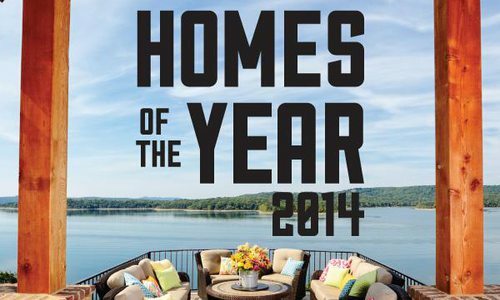 Take a look at the best of the best, then get to work on creating your very own dream home.—S.W. Bring the home into the 21st Century and have it match the owners’ style and interests. 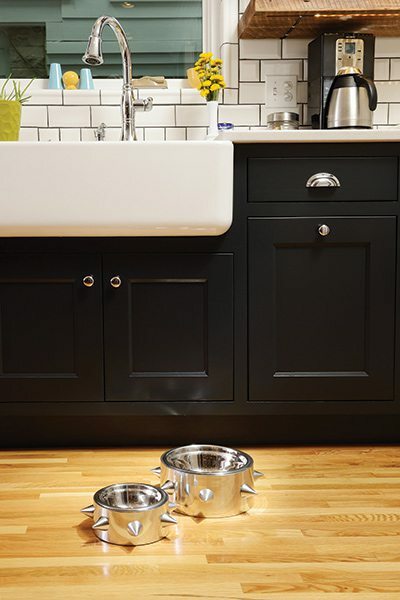 What started as a simple bathtub installation ended up becoming a whole-home remodel for designer Nathan Taylor and his team, but the end result is absolutely stunning. “This home was very dark and closed in,” Taylor says. “The wife wanted to build new and start over, but the husband didn’t want to leave the property.” That meant Taylor had to find a way to breathe new life into this home while retaining the original structure. 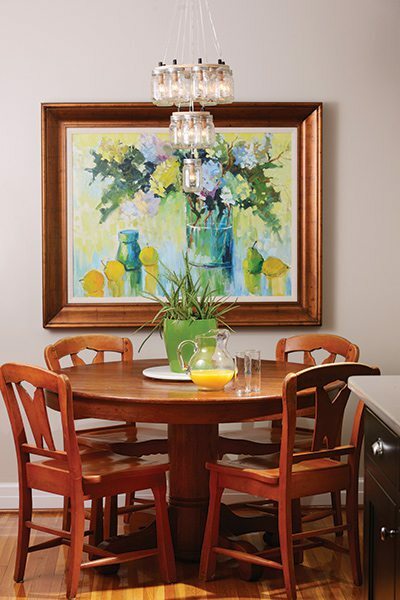 Taylor needed to incorporate the owners’ style and love of art in a way that would make the family feel right at home. He had his work cut out for him. Instead of the polished woodwork that now gleams in the sunlight, the home’s large wood beams, flooring and cabinetry were all a yellow oak that made the home look outdated. To give the spacious country property a more modern look, much of it had to go. The doors were raised to 8 feet, all cabinetry was replaced on the main floor, hardwood floors were refinished, LED track lighting was installed, skylights were added to the vaulted ceiling and the thick wood beams and ceiling were re-stained a darker, more elegant color. Now instead of an outdated, gloomy home, the space shines with style and warmth.—E.B. 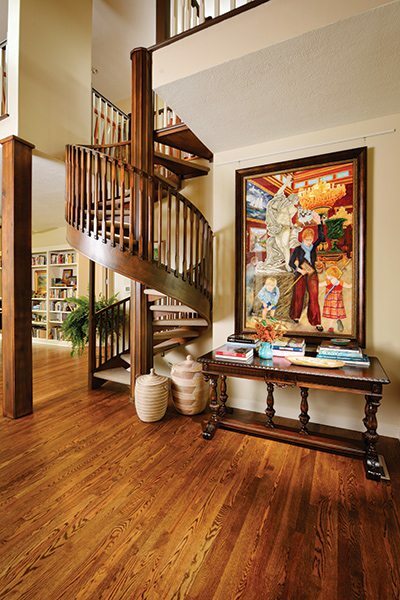 Photos by Jeremy Mason McGrawOne of the home’s central features is the beautiful spiral staircase that connects to the second floor. Taylor had Bearden Carpets carpet the stairs and added extra spindles to make it safer for the couple as they age in the home. Playing off of the dark wood of the staircase is the striking painting done by Karen Schneider. “The piece is absolutely breathtaking in person,” Taylor says. 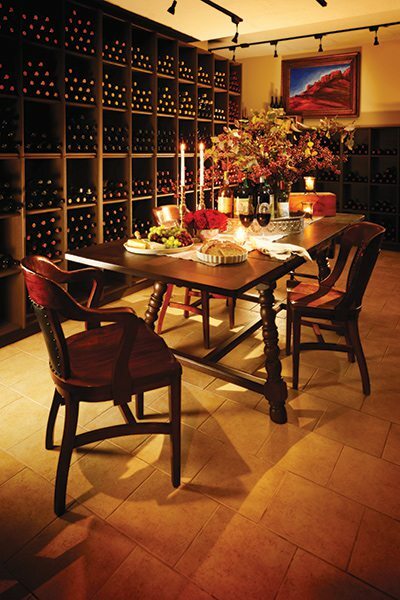 Photos by Jeremy Mason McGrawThe family's wine cellar was refinished so that it could be used for dinner parties and wine tastings. Taylor stacked the shelving that used to run down the center of the room to make the storage for the wine bottles along the far wall. Photos by Jeremy Mason McGrawSince the family loves to entertain, Taylor completely restructured the kitchen to make it ideal for playing host. The bar, which was originally two different levels, was leveled and topped with granite. The sink was relocated to the bar, and because it’s an entertaining sink, it can be completely closed off and used as a prep area or serving area. And those everyday kitchen cabinets were rebuilt with glass panels to showcase the couple’s collection of Italian serveware that has been passed down through generations. “We wanted the cabinets to look like furniture,” Taylor says. For a finishing touch, Taylor added new barstools that add a touch of sophisticated style to the room. 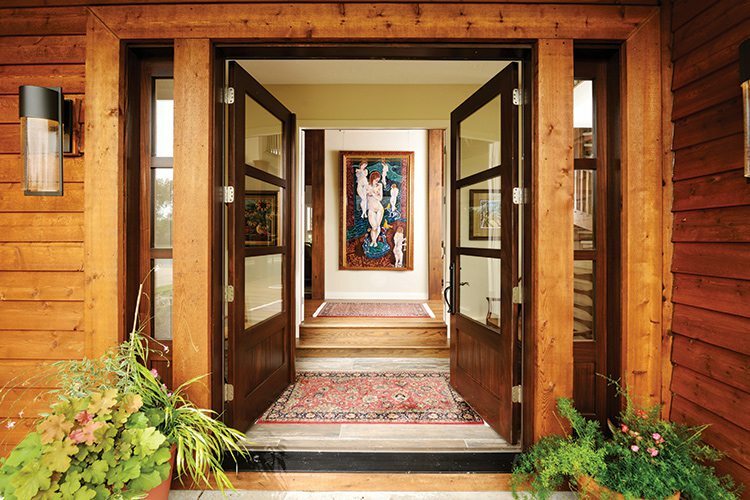 Photos by Jeremy Mason McGrawTo make the front entryway feel more spacious and bright and give guests a sneak peek at the beautiful home inside, Taylor installed wooden doors with glass panels. Now the walk up to the house is even more breathtaking as you catch a glimpse of the art inside. Photos by Jeremy Mason McGrawPlanning around the homeowners’ love of playing host, Taylor brought in a large sink that can be easily covered to create a prep or serving station. Photos by Jeremy Mason McGrawTo brighten the room, the oak woodwork was painted white. An art hanging system was installed here and around the house to allow the owners to easily change their art without having to repair the walls. Photos by Jeremy Mason McGrawTaylor wanted to showcase the owners’ love of art, so he laid out their collection of art books around the house, including on the table near the entryway. Photos by Jeremy Mason McGrawSince the owners love the outdoors, Taylor installed a large window that looks out on to the property. But all that natural light meant the family needed blackout drapes to accommodate their irregular sleeping schedule. Photo by Jeremy Mason McGrawNew floors, cabinetry, appliances and a subway tile backspash all helped transform this kitchen into a gorgeous and functional space. 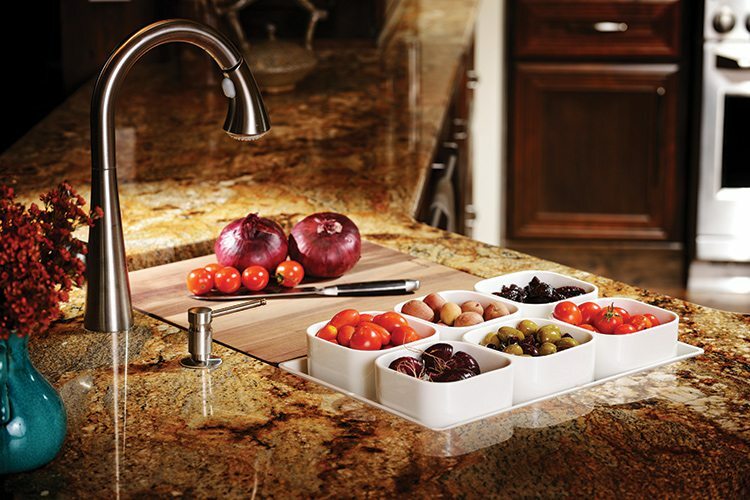 Give the homeowners a more spacious and functional kitchen without adding extra square footage to the home. It’s no wonder this fun and eclectic kitchen has been added to more than 10,000 idea books on Houzz, or that it was featured on Houzz as the kitchen of the week. Bright and spacious, this kitchen is just plain dreamy. But when designer Nathan Taylor first walked in, it was cramped, dark and didn’t meet the growing family’s needs. “It doesn’t matter how big or how small your house is,” Taylor says. “Everyone congregates in the kitchen, but there wasn’t room in this house.” But by the time Taylor and his team were done working on the room, the family had all the space they could dream of. To open the room and improve its functionality, Taylor knocked down the load-bearing wall that separated the kitchen and the dining room. New appliances were brought in and rearranged in the space, new hardwood floors were installed, the walls were painted a brighter and more inviting color, and modern light fixtures and a subway tile backsplash were added to give the kitchen a pop of modern style. The old narrow cabinets that required a force of nature to close were replaced with open shelving that used repurposed wood taken from Obelisk Home. 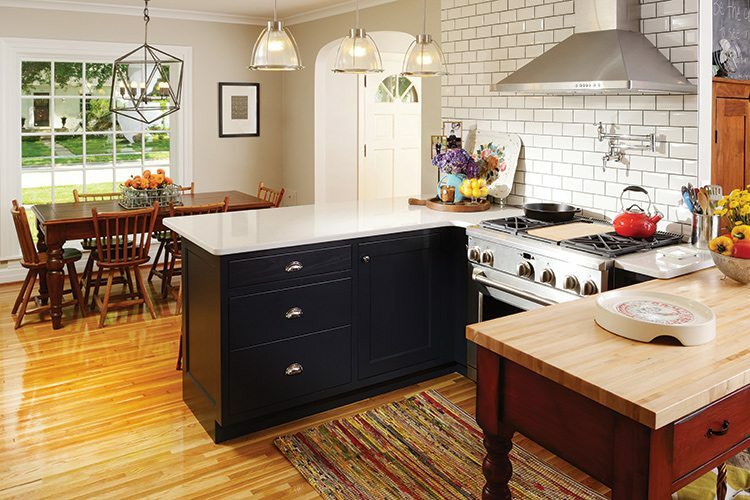 The island features a butcher block top and drawers that can be pushed open from either side, which, with the fact that the whole island is on glides, makes this piece incredibly functional. 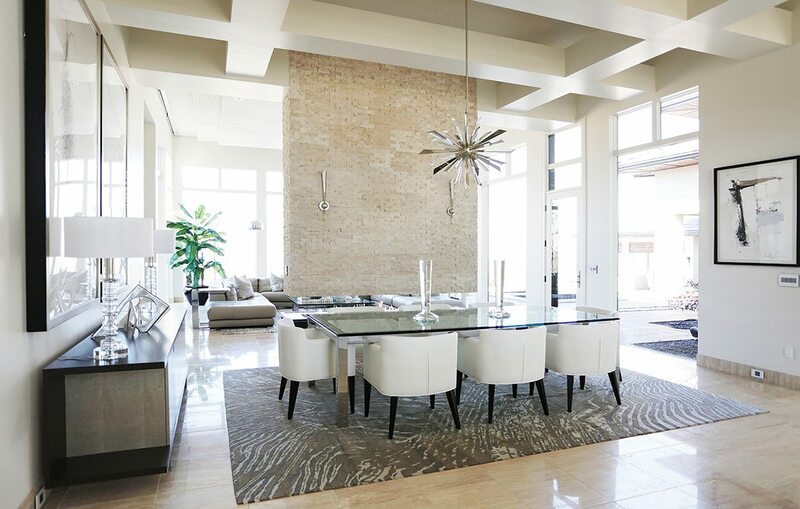 Once all the construction was complete, the finished product gives the family the perfect place to gather for dinner, entertain friends or just unwind from a long day. “The owners wanted the kitchen to feel in sync with the original home,” Taylor says. “This gives them the style they want with all the modern conveniences they were missing.”—E.B. Photo by Jeremy Mason McGrawNathan Taylor transformed an old, cramped kitchen into a spacious spot for the family to gather. Photo by Jeremy Mason McGrawThanks to these new dishes, even the pets in the home benefited with the remodel. Photo by Jeremy Mason McGrawTaylor designed the kitchen with pops of gorgeous artwork. 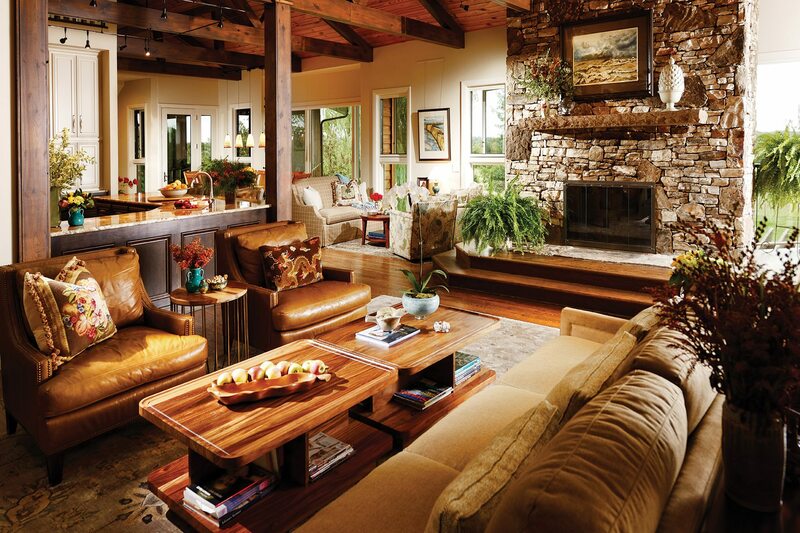 Transform an underutilized multi-purpose room into a cozy, upscale lounge complete with hearth and game areas. 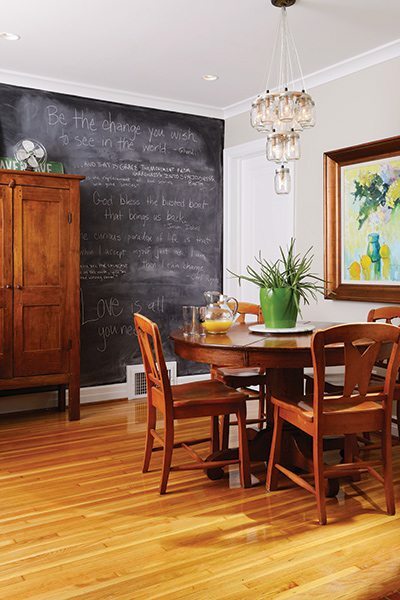 When their kids were heading off to college, these homeowners wanted to create a cozy space for entertaining, and they looked to Buxton Kubik Dodd Creative’s interior designer Brandi Bailey for help. 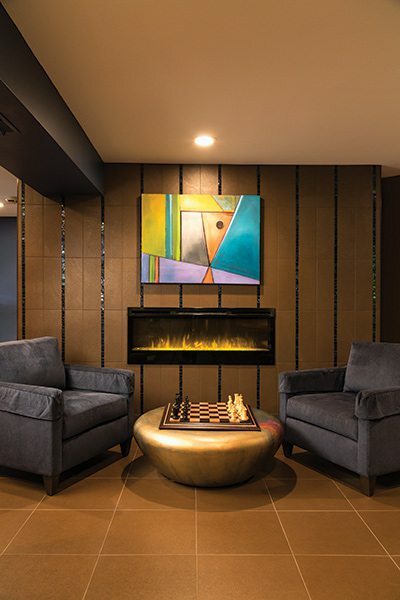 Bailey worked to transform a dated multi-purpose room to an entertainment space for friends and family, and she added a sleek hearth area as a unifying focal point. Before the space was remodeled, it was used as a catch-all area and home to a fish tank, an air hockey table, a drum set and an artist station. One of the debates for the remodel was having a pool table or dining room to accompany the cozy new hearth area, because there wasn’t room for both. But Bailey found a solution to accommodate both homeowners’ wants with a dual purpose pool and dining table. The table has an adjustable height and removable sections on top, allowing it to easily transition from a game space to an eating area. While the new hearth area is the perfect space for the homeowners to cozy up and relax on a quiet night in, it also easily transforms into a quiet spot for conversation when the adjoining game area is buzzing with activity. Bailey found a creative solution to combine two traditionally separate areas in a modern and unexpected way, and the homeowners couldn’t be happier with the outcome.—K.J. Photos by Chuck TraversSleek tile and modern furnishings make this new hearth room one of the home’s most coveted seating areas. Photos by Chuck TraversThe hearth area is located adjacent to a game room complete with a pool table and an expansive bar (above). 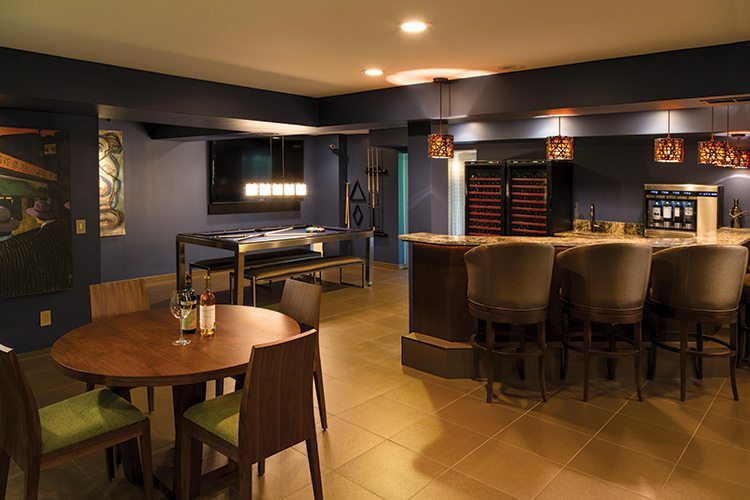 Photos by Chuck TraversThe hearth area is located adjacent to a game room complete with a pool table (above) and an expansive bar. Create a stunning formal space that is jaw-dropping and luxurious, yet comfortable, all while adding a bit of a contemporary flair. This living room offers a golf course view, and the couple, Ken and Laura Treat, knew they didn’t want to distract from the beautiful greens. They also knew they wanted to balance the large windows with proportional furniture pieces, and Laura wanted to make sure that Ken would get his desired contemporary feel without making the space feel cold and austere. “After selecting new paint for the entire home in warm grays, we finally had a starting point,” Landolt says. 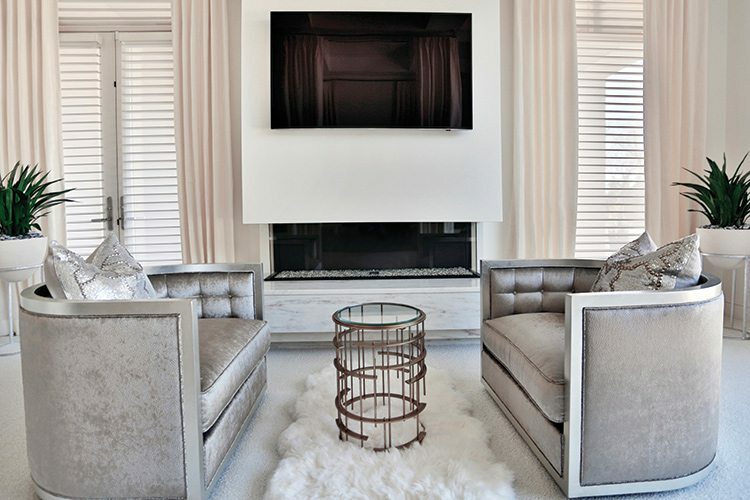 They chose a luxurious shag rug to make a statement, and they selected elegant Libby Langdon furniture pieces with beautiful, contemporary feminine lines. They decided to flank the fireplace with a pair of sofas and added extra seating with an updated tufted wing-back chair and cocktail ottoman. And last but not least, they added shimmering champagne pillows and brushed brass accents to soften the room and create a warm glow. “The pillows add a little glam, but we were careful to create an area where guests would feel comfortable sitting down,” Landolt says. And aside from adding that bit of glitz, the shimmery pillows serve another purpose: they pick up on the metallic design on the wallpaper in the adjacent dining room. “It’s a balancing act,” Landolt says. “We were careful to make sure that nothing felt out of place.”—S.W. Photos by Jeremy Mason McGrawWhile designing this living room, designer Heather Landolt was careful not to distract from the view of the golf course. Photos by Jeremy Mason McGrawShimmery fabrics used on the pillows in the living room help pick up the metallic patterns on the wallpaper and décor. Photos by Jeremy Mason McGrawShimmery fabrics used on the pillows in the living room (above) help pick up the metallic patterns on the wallpaper and décor. Photo by Jeffrey SweetDetailed beam work, a 14-foot ceiling and a custom-designed central fireplace all work together to make this dining room feel open and airy. Create a space that flows well with the living room and works as part of a main, open area for entertaining. This new construction project was a blank slate for designer and homeowner Patti Johnson. She had a distinct vision in mind—to create an open living space with a cool and serene feel in every room. Another one-of-a-kind feature in the room is the suspended open fireplace, which Johnson also designed. It allows for a seamless flow between the living and dining rooms, but still creates a visual block to separate the areas. Continuing with the airy feel of the room, Johnson chose a glass table with low, neutral matching chairs to blend elements of the room together. She wanted the table to float. “This leaves more attention to the art and fireplace,” Johnson says.—K.J. Photo by Jeffrey SweetDesigner Patti Johnson designed this master bedroom to be calm and inviting, yet still offer major wow factor. 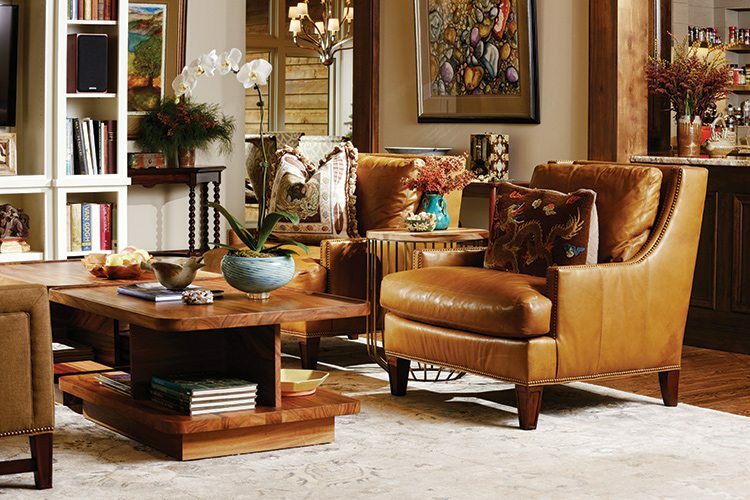 Create a calm, restful space with major wow factor. Patti Johnson, both the interior designer and homeowner of this master bedroom, wanted a relaxing space that still had personality and charm. She started with the color scheme, which included all shades of cream, silver, gunmetal and gold. Johnson knew she wanted the bed to be the focal piece of the room, and she planned the space around it. The bed was custom designed and adds a contemporary flair with the magnificent floor-to-ceiling draperies and mixtures of fabrics, textures and colors. To make an even more inviting space, Johnson added a seating area complete with a fireplace that has three sides of glass, glass rocks and a marble hearth. The final touch of the room was the addition of mirrored boxes on the ceiling, fashioning a distinct level of sophistication and drama. The modern and sleek bedroom combines a little glam, a little glitz and a whole lot of style to make it a space fit for royalty.—K.J. The entire master bedroom boasts a light, airy feel. 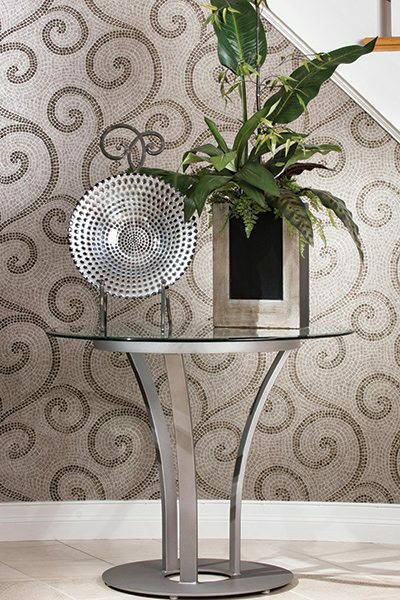 Architectural elements add to the drama of the room. Designer Patti Johnson designed this master bedroom to be calm and inviting, yet still offer major wow factor. Photo by Gayle Babcock Architectural Imageworks, LLCRock Solid Renovations turned a bedroom, bathroom and closet space into a luxurious, tropical oasis. Transform unused bedroom, bathroom and closet space into a luxurious master suite with a tropical feel. While Jeremiah Lee specializes in architectural drawings and planning and Susie Edie regularly perfects interior design finishes, the two Rock Solid Renovations pros regularly tackle projects as a team. That was the case in this remodel work at this home, which was originally built in 1976. The owners looked to Rock Solid Renovations to create a master suite that echoed the architectural styles they regularly enjoy on their travels to Hawaii. But it took much more than just a simple facelift to reach their goal—it also took a bit of restructuring. The project started by gaining additional space, utilizing an unused bedroom and bathroom that adjoined the existing master suite. “We were able to take two small dated bathrooms and two closets and combine them to create the master suite,” Susie says. After the new space was created, the team got to work making it beautiful. 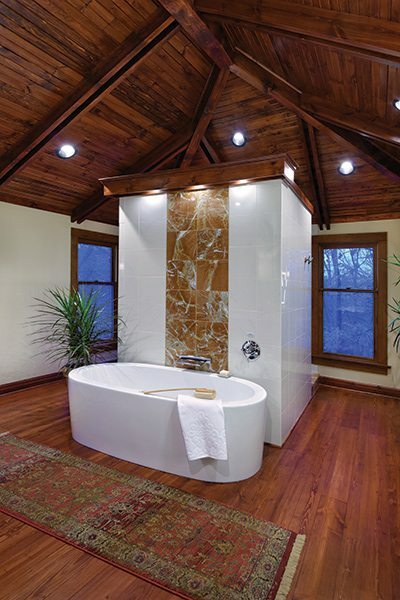 They replaced the space’s old 8-foot flat ceiling with a vaulted ceiling complete with exposed beams and wood cladding, and they added a large freestanding tub that greets the owners as they enter. A marble clad Roman shower occupies the opposite side of the bathtub wall, and new casework was designed to create a double vanity, a make-up vanity and a custom closet system complete with a center island. “Now the feel is similar to a classy, tropical-style spa,” Susie says. 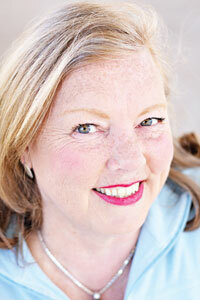 “The clients are thrilled with the outcome.”—S.W. Photos by Gayle Babcock Architectural Imageworks, LLCTwo small bathrooms and two closets were transformed to create this master suite, now complete with a double vanity, a make-up vanity and a custom closet. Photos by Gayle Babcock Architectural Imageworks, LLCGorgeous woodwork and a free-standing tub complete this bathroom remodel by the team at Rock Solid Renovations. Photos by Gayle Babcock Architectural Imageworks, LLCThis custom closet takes advantage of the space for function and display. Photo by Gayle Babcock Architectural Imageworks LLCA black tile backsplash contrasts beautifully with the white sink and marble flooring. To create a small bath for the main floor that has wow factor yet retains the home's historical character. The existing antique iron tub was removed and relocated to the new master bathroom upstairs. 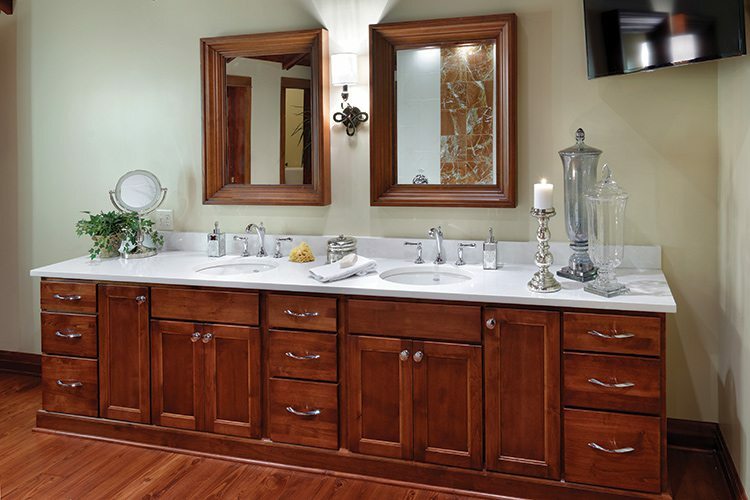 The antique pedestal sink was refinished and relocated into the new smaller bath, and a new toilet was set in the space. The existing, previous dark shower was paved with crisp white tile and given a glass door, and a simple marble floor was added to lend a classic, unfussy feel. 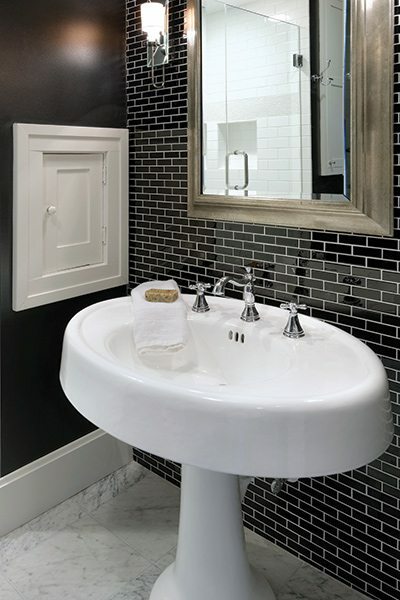 To add a bit of a dramatic effect, the wall behind the sink was paved with small glass tiles in glossy black, and the rest of the walls were painted to match. 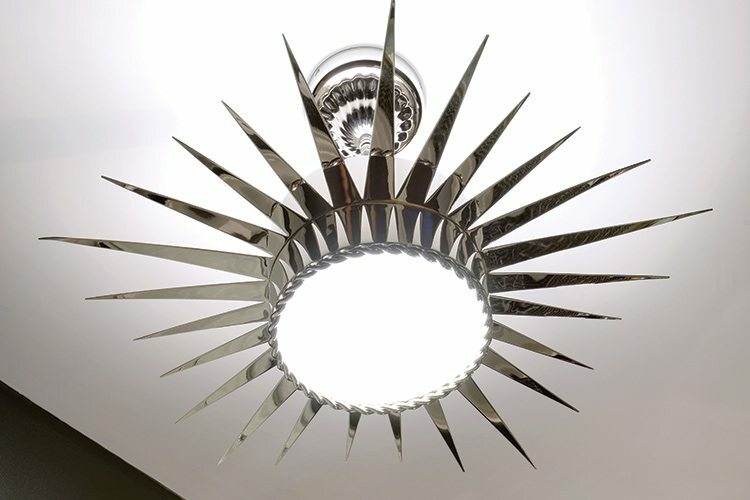 A polished nickel light fixture with spiky arms was added to the ceiling and casts dramatic shadows in the room, and polished nickel fixtures and hardware give the space a punch. “The new space is the perfect blend of classic and contemporary,” Wieland says.—S.W. Photos by Gayle Babcock Architectural Imageworks LLCA black tile backsplash contrasts beautifully with the white sink and marble flooring. Photos by Gayle Babcock Architectural Imageworks LLCThe chandelier adds movement to the space. Photo by Steve PearcyThis office has a traditional, Old World feel. Transform a pantry just off of the kitchen into an elegant home office. The owners of this house recently added a pool, and they needed a major renovation to create a seamless flow from inside to poolside. They turned to Interior Designer Andrea Deckard for help. The office had to be relocated, and with not much square footage to work with, Deckard knew that maximizing the space was essential. 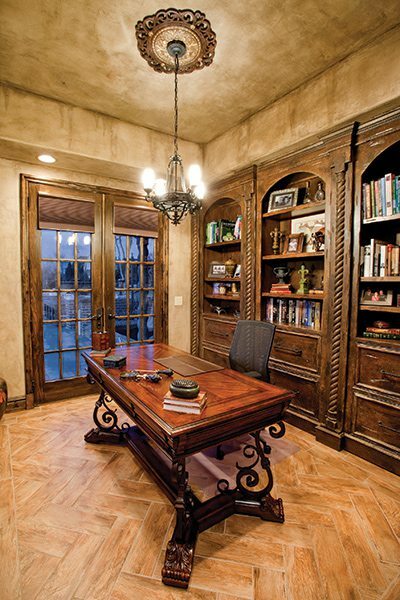 She created several creative solutions to make this new office work for the homeowners. Behind the bookcases is a hidden door, which provides one of three points of entry into the room. The bookcases also have filing cabinets underneath, eliminating the need for bulky storage under the desk. They also added a bay window with additional seating and a set of French doors. “We wanted it to be functional, not just attractive,” says Deckard. Another unique feature of the office is the beautiful herringbone floor design, which looks like wood but is actually porcelain tile that won’t be damaged by wet feet or the rolling office chair. To complement the traditional and heavy European style present throughout the entire home, Deckard also included signature accents like the ceiling pendant, the faux finish of the walls, and the desk with beautiful wrought iron legs and a marquetry wood top.—K.J. Photo by Steve PearcyDesigned in a herringbone pattern, the porcelain tile in this office has the look of wood but won’t be damaged by the rolling office chair or wet foot traffic from the nearby pool. Photo by Jeremy Mason McGrawThis guest bedroom makeover offers plenty of natural comforts. Create a guest bedroom that offers a beachy environment and represents the homeowner's love of Nantucket. Forget about scheduling flights and packing luggage for a relaxing weekend in Nantucket. Just sprawl out in this room, and watch the clouds float by overhead as the clink of seashells transports you to those sandy beaches thousands of miles away. With the exception of the carpet, the ceiling fan and the bed, designer Nathan Taylor and his team changed everything about this guest suite and transformed it into a relaxing oasis. “The family loves to vacation in Nantucket, so we knew we needed to incorporate the greens and blues from the ocean,” Taylor says. He even had his team paint the ceiling, turning it into a dreamy, cloud-dotted sky. The walls got a splash of warm seafoam green, and chandeliers fringed with delicate seashells hang on either side of the bed to really bring that beach atmosphere into the room. But those shimmering shells aren’t just ornamental. When the air conditioning kicks on, the shells gently clink together to create a quiet serenade. For that finishing touch, Taylor decorated the walls with pieces of driftwood and artwork by Gavyn Sky, and linen pillows and a linen wingback chair were added to add a soft touch.—E.B. 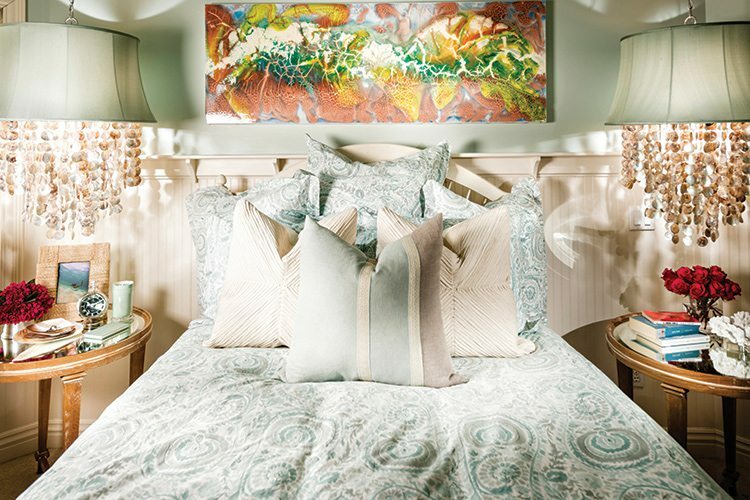 Photos by Jeremy Mason McGrawShades of green and blue pair with seashells and driftwood to create an ocean-side feel in this guest suite. Photos by Jeremy Mason McGrawCalming tones and cozy furnishings work together to make the room a relaxing escape. Photos by Jeremy Mason McGrawWhen the air conditioning turns on, the seashells on the lamp shades clink together. Photo by Jeremy Mason McGrawPops of color add to the fresh design of this children's suite. 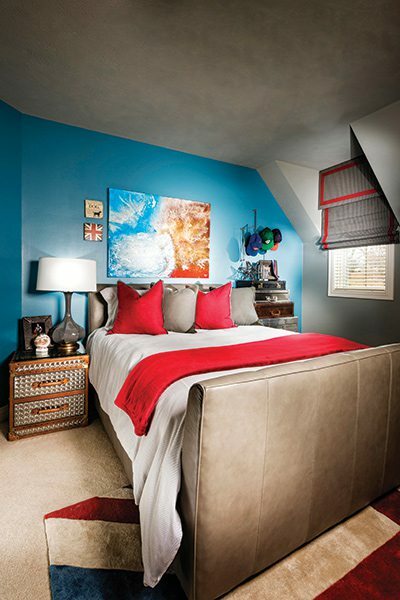 Turn a youthful bedroom into a timeless and masculine space. 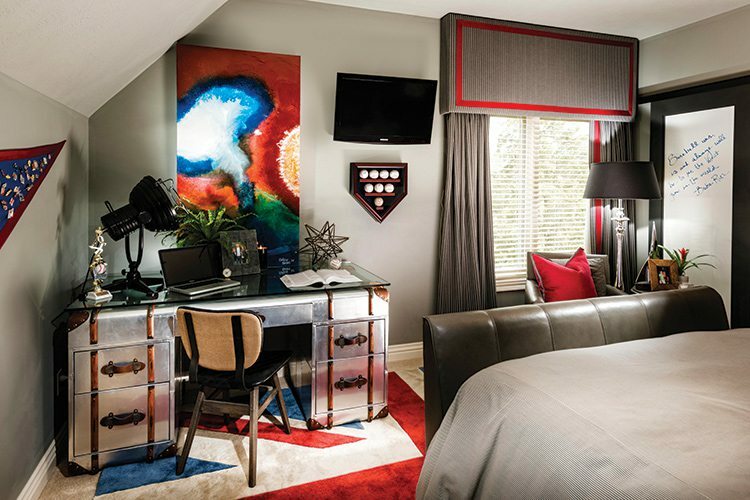 Instead of working with homeowers who have years of ideas stashed away for when they remodel, designer Nathan Taylor and his team worked on this bedroom suite with a 15-year-old boy and used his love of baseball as the base for redesign. When Taylor first started on this project, the room was truly an ode to America’s favorite pastime. 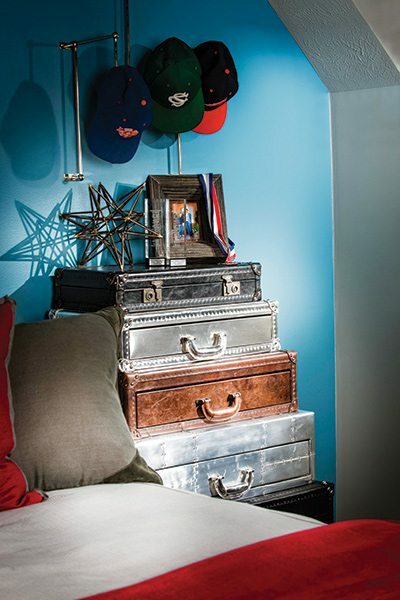 The walls were covered with baseball stitching, and the bunkbed was adorned with tiny handpainted baseballs and bats. While the young baseball enthusiast wanted to keep the baseball theme, it was time to give the room a more adult and masculine style. “We wanted to give him a room he could still enjoy when he’s in college,” Taylor says. That meant giving the room a new polished look. The bedding was picked out, wall colors were selected and new furniture was brought in. And while the room got a stylish facelift, that homage to baseball was never ditched. Even the bedding and window treatments, complete with the blue and white ticking and red top stitching, harken back to the glory days of baseball when the New York Yankees reigned over the ball diamond. Taylor and his team were able to knock this project out of the park. To give the room a more adult style that would last its owner well into college, a large leather bedframe was added, as were an oversized leather chair, end tables and a modern desk. And all those baseball collectables—they were neatly organized on pennants and put on display. Vibrant artwork by Shelly Forbes was hung on the walls, and the closet door was swapped out for a sliding barn door that also serves as a dry erase board where family and friends can leave notes. The finishing touch was a massive British flag rug. “He really wanted an ode to Great Britain,” Taylor says. 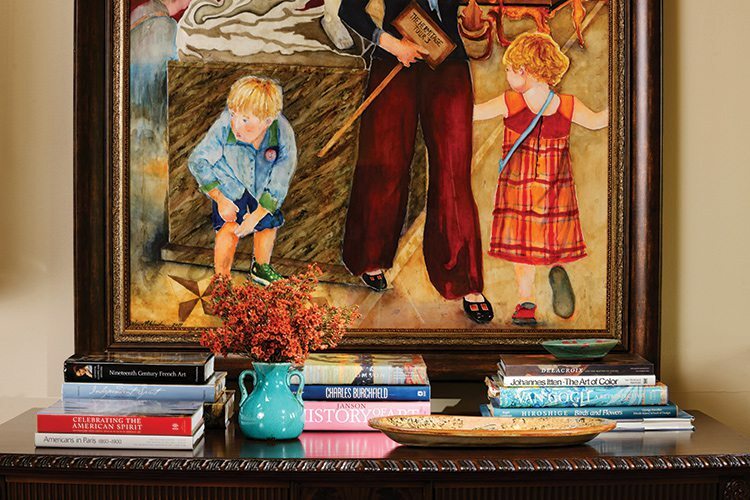 “This room is very eclectic, but it’s also timeless.”—E.B. Photos by Jeremy Mason McGrawWhile he gave the room a sophisticated look, Taylor made sure it still spoke to the boy’s love of baseball. Photos by Jeremy Mason McGrawDesigner Nathan Taylor used new bedding, paint and furnishings to give this teenage boy’s room an age-appropriate makeover. Photos by Jeremy Mason McGrawEclectic furnishings were brought in to complete the space. 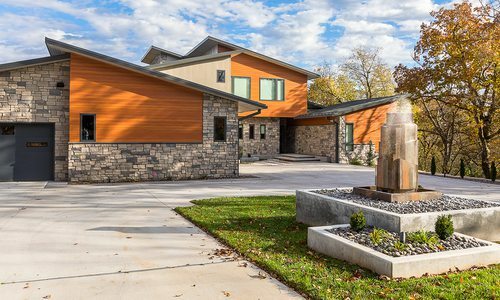 Meet the experts from the American Society of Interior Designers MO-East Chapter who judged this year’s 417 Home Design Awards. 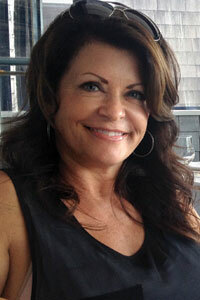 Kay Hagan has more than 30 years of experience as a professional residential and commercial designer. Hagan owns her own full-service interior design and consulting firm, and she has spent years as a professor, interior design program director and art department chairperson at St. Louis Community College. 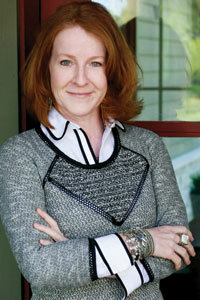 She is currently president of the American Society of Interior Designers MO-East Chapter. Stephanie Kusmer currently works for her family-owned full-service interior design firm and has been helping her clients achieve their dream homes as a residential interior designer for more than 17 years. Kusmer is a 10-year allied member of ASID, and served on the board as ASID MO-East Professional Development Director from 2007–2009. 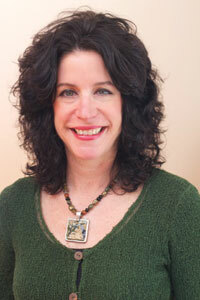 Georgine O’Donnell first became a student member of ASID in 2007, and she’s been involved ever since. 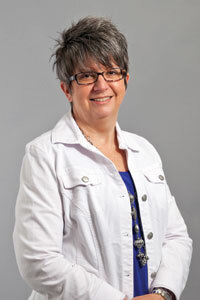 She has been the director of professional development since 2013. O’Donnell regularly practices her design skills with her business, O’DESIGNS, where she specializes in custom designs of residential spaces. 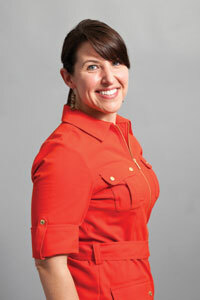 O’Donnell says she enjoys presenting new ideas to clients as she helps them achieve their goals. Since establishing his design firm in the 1980s, Idol’s design work has taken him across the globe working on a wide variety of projects from commercial showrooms and retail stores to beautiful residential spaces. His work is sleek and classy, yet edited, and interwoven within a contemporary flair to create timeless designs. 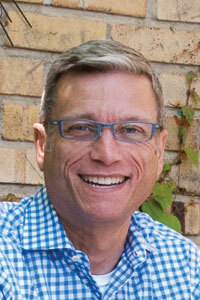 Idol is a professional member of the American Society of Interior Designers and is NCIDQ certified. 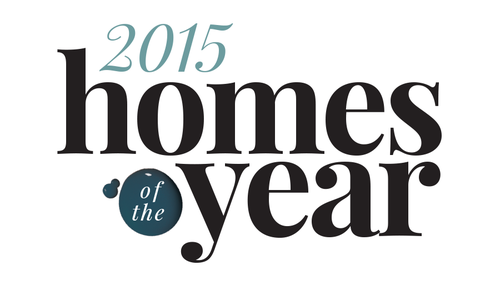 Get to know the winners of the 2015 417 Home Design Awards, each specializing in transforming houses into gorgeous homes. 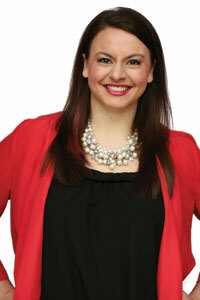 Interior Designer Brandi Bailey has been practicing interior design for 10 years. 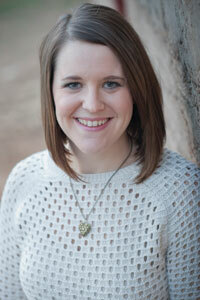 Bailey works at Buxton Kubik Dodd Creative, a firm that offers both commercial and residential design services. Bailey is also involved in the Springfield Design Association and has served as both the vice president and president in past years. In 2014, Bailey was chosen to receive the Rosebud Award by the National Association of Women in Construction, which recognizes success of women in the construction industry. 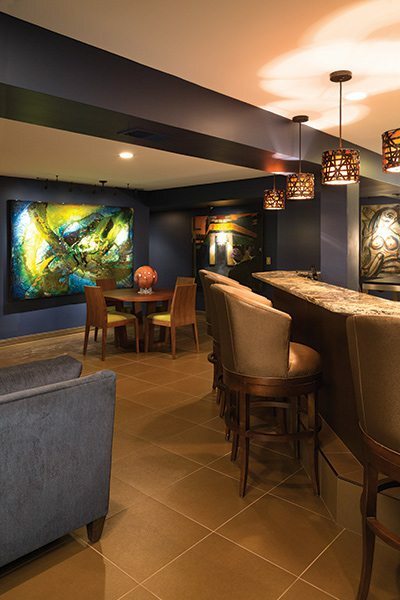 Andrea Deckard works as both a residential and commercial interior designer, with her firm designing everything from residential spaces to hotels, restaurants, offices, banks, health care facilities and more. Deckard has been practicing interior design for 17 years, and she loves using her creativity to design spaces that reflect her clients’ personalities and functional needs. Her firm, A. Deckard Interiors, prides itself on meeting challenges, solving problems and coming up with creative solutions. With 27 years of experience under her belt, Interior Designer Susie Edie knows the ins and outs of both commercial and residential interior design. 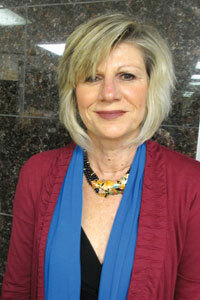 Edie regularly assists clients of Rock Solid Renovations, the design-build company she works at. As a designer here, Edie coordinates with the project manager and subcontractors, helps clients select finishes and much more. 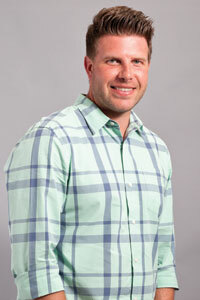 Edie often works as a team with the lead designer at Rock Solid Renovations, Jeremiah Lee. 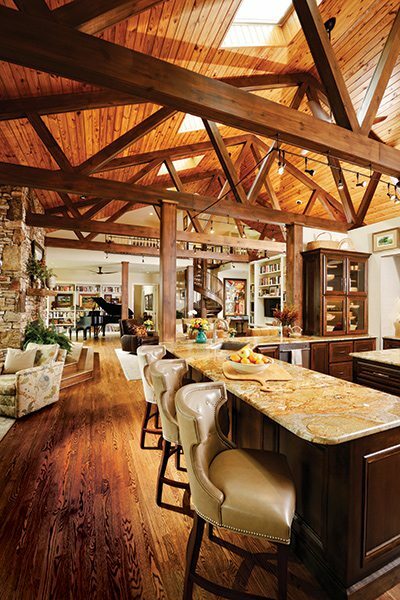 While Patti Johnson is currently retired from the design business, she recently designed her gorgeous jaw-dropping home. Johnson has 18 years of residential design experience, and she says her favorite thing about the art is creating a space all the way from a concept drawn on paper to the very last finishing touches. Johnson has drawn, designed and built four homes in Springfield that range from traditional to country French, formal French and contemporary. An interior designer at Decorating Den Interiors, Heather Landolt works with a wide range of both residential and commercial clients and regularly helps them all create one-of-a-kind solutions in their homes, no matter what style of décor they prefer. Landolt has been an interior designer for seven years, and she says her absolute favorite part of her job is seeing her clients’ excited faces as they look at their newly designed space for the very first time. Lead designer and co-owner of Obelisk Home, Nathan Taylor has been designing interiors for more than two decades. 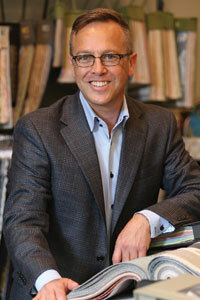 Taylor oversees both residential and commercial projects from initial construction plans to finishing interior details. He believes that any space, whether traditional or contemporary, can be warm and personal by adding collected or family pieces into the design. Together with the Obelisk Home team, Taylor executes spaces that reflect the vision and needs of clients. As the lead designer at Rock Solid Renovations, Jeremiah Lee regularly spends his days working with clients to develop overall conceptual designs of their spaces. Lee has a decade of experience and has perfected the craft of catering to the client’s needs in a way that is both functional and aesthetically pleasing. Lee regularly works with designer Susie Edie and the rest of the Rock Solid Renovations team, which can provide complete start-to-finish service to clients. As a custom home designer and owner of Wieland Studio, LLC, Susie Wieland loves helping her clients create homes that support their lifestyles. Wieland has 19 years of design experience and offers services that range from new design to assistance on remodels and additions, and she also offers design for exterior spaces. Wieland has a special passion for adapting historic homes to meet contemporary living styles while maintaining the home’s original character.